Veera Pandiya Kattabomman (Veera= brave) hailed from Panchalankurichi (present day Tirunelveli), Tamilnadu. His father Aadi Kattabomman was a minister in the court of Jagaveera Pandiyan, a descendent in the pandiyan line, Jagveera Pandiyan was issueless and declared Kattabomman as his successor. Since Kattabomman was the first of the new clan, he came to be known as Adi Kattabomman (Aadi = first or beginning). 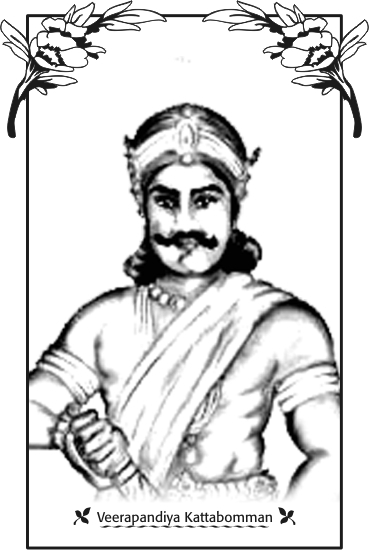 Veer Pandiya Kattabomman was born to Aadi Kattabomman and Aarumugathammal on January 3, 1760 and became the 47th king of Panchalankurichi at an age of 30. He is among the kings in southern India who resisted the British East Indian Company. He initially evaded tax that the British demanded and ignored repeated summons to meet collector Jackson. Later his meeting with Jackson ended up into a Physical combat in which Deputy Commandant of the Company’s forces, Clarke was slain. He later revolted against the British refusing to pay taxes when a new collector was assigned to retrieve due taxes. This resulted in the British East India Company, under the leadership of Major Bannerman dispatched army to capture Kattabomman. Company’s army engulfing Kattabomman’s fort at Salikulam, a few miles from Panchalanckurichi, intended to arrest him there which later turned out to be a losing battle for the British, losing a great fraction of the assigned troops and Lieutenant Collins. Immediately after the retraction of the British forces Kattabomman vacated his fort suspecting cannon attacks from the British, which his fort might not withstand. The East India Company priced his head. He was later betrayed by Ettappan which resulted in his arrest and execution later. He was hung from a tamarind tree in 1799. After that his fort was completely demolished by the British and his wealth was looted. Government of Tamilnadu honoured the hero by raising a monumental fort at Panchalankurichi in his memory. His name is remembered among the people as a brave Tamil hero who stood against the British long before the first war of Indian independence that would be instigated by Mangal Pandey on 1857.
very very……………………………thanks to,praveen reddiyar and god night…….